Driving Under the Influence: How Music Listening Affects Driving Behaviors Jordan Navarro1,2, François Osiurak1,2, Vivien Gaujoux1, Marie Claude Ouimet3, Emanuelle Reynaud1 1Laboratoire d'Etude des Mécanismes Cognitifs (EA 3082), University Lyon 2, 2Institut Universitaire de France, 3Faculté de médecine et des sciences de la santé, Université de Sherbrooke Here, we present a protocol to assess driving behaviors while following a vehicle in a simulated driving environment. The presented protocol is used to compare the impact of different auditory backgrounds on driving behaviors. Initial Evaluation of Antibody-conjugates Modified with Viral-derived Peptides for Increasing Cellular Accumulation and Improving Tumor Targeting Simon Beaudoin1, Michel Paquette1, Laurent Fafard-Couture1, Mylene A. Tremblay1, Roger Lecomte1,2,3, Brigitte Guérin1,2,3, Jeffrey V. Leyton1,2,3 1Department of Nuclear Medicine and Radiobiology, Université de Sherbrooke, 2Sherbrooke Molecular Imaging Center (CIMS), Université de Sherbrooke, 3Sherbrooke Institute of Pharmacology Viral-derived peptides coupled to antibody-conjugates (ACs) is an approach gaining momentum due to the potential of delivering molecular payloads with increased tumor cell accumulation. Utilizing common methods to evaluate peptide conjugation, AC and payload intracellular accumulation, and tumor targeting, this protocol helps researchers during the key initial development phases. A Simple and Efficient Protocol for the Catalytic Insertion Polymerization of Functional Norbornenes Basile Commarieu1, Jonathan Potier1, Moubarak Compaore1, Raphael de Boever1, Regis Imbeault1, Jerome P. Claverie1 1Department of Chemistry, Université de Sherbrooke We describe the catalytic insertion polymerization of 5-norbornene-2-carboxylic acid and 5-vinyl-2-norbornene to form functional polymers with a very high glass transition temperature. Step-specific Sorting of Mouse Spermatids by Flow Cytometry Olivier Simard*1, Frédéric Leduc*1, Geneviève Acteau1, Mélina Arguin1, Marie-Chantal Grégoire1, Marc-André Brazeau1, Isabelle Marois2, Martin V. Richter2, Guylain Boissonneault1 1Department of Biochemistry, Université de Sherbrooke, 2Department of Medicine, Université de Sherbrooke We describe a sorting strategy for mouse spermatids using flow cytometry. Spermatids are sorted into four highly pure populations, including round (spermiogenesis steps 1-9), early elongating (spermiogenesis steps 10-12), late elongating (spermiogenesis steps 13-14) and elongated spermatids (spermiogenesis steps 15-16). DNA staining, size and granulosity are used as selection parameters. Selective Area Modification of Silicon Surface Wettability by Pulsed UV Laser Irradiation in Liquid Environment Neng Liu1, Khalid Moumanis1, Jan J. Dubowski1 1Laboratory for Quantum Semiconductors and Photon-based BioNanotechnology, Interdisciplinary Institute for Technological Innovation, Laboratoire Nanotechnologies Nanosystèmes (LN2)- CNRS UMI-3463, Faculty of Engineering, Université de Sherbrooke We report on a process of in situ alteration of HF treated Si (001) surface into a hydrophilic or hydrophobic state by irradiating samples in microfluidic chambers filled with H2O2/H2O solution (0.01%-0.5%) or methanol solutions using pulsed UV laser of a relative low pulse fluence. Immunofluorescence to Monitor the Cellular Uptake of Human Lactoferrin and its Associated Antiviral Activity Against the Hepatitis C Virus Andréa Allaire1, Frédéric Picard-Jean1, Martin Bisaillon1 1Département de biochimie, Faculté de médecine et des sciences de la santé, Université de Sherbrooke The human lactoferrin (hLF) is a component of the immune system. In this study, immunofluorescence assays are used to demonstrate both the hepatocellular uptake of hLF and a qualitative reduction in the hepatitis C virus replication upon treatment with hLF. Simultaneous pH Measurement in Endocytic and Cytosolic Compartments in Living Cells using Confocal Microscopy Fabrice Lucien1, Kelly Harper1, Pierre-Paul Pelletier1, Leonid Volkov2, Claire M. Dubois1 1Department of Pediatrics, Faculty of Medicine and Health Sciences, Université de Sherbrooke, 2Biophotonics Core Facility, Centre de Recherche Clinique Etienne-Le Bel Several methods are available for measuring intracellular pH but very few of these allow simultaneous measurement of cytoplasmic and organellar pH. Here, we describe in detail a rapid and accurate methodology to simultaneously measure cytoplasmic and vesicular pH by ratiometric imaging of living cells. A Dual Tracer PET-MRI Protocol for the Quantitative Measure of Regional Brain Energy Substrates Uptake in the Rat Maggie Roy1, Scott Nugent1, Sébastien Tremblay2, Maxime Descoteaux3, Jean-François Beaudoin2, Luc Tremblay2, Roger Lecomte2,4, Stephen C Cunnane1 1Research Center on Aging and Department of Physiology and Biophysics, Université de Sherbrooke, 2Sherbrooke Molecular Imaging Center, Étienne-Le Bel Clinical Research Center, Université de Sherbrooke, 3Department of Computer Science, Université de Sherbrooke, 4Department of Nuclear Medicine and Radiobiology, Université de Sherbrooke Small-animal positron emission tomography enables the assessment of the brain's two main energy substrates: glucose and ketones. In the present method, 11C-acetoacetate and 18F-fluorodeoxyglucose are injected sequentially in each animal, and their uptake is measured quantitatively in specific brain regions determined from the magnetic resonance images. Nanofabrication of Gate-defined GaAs/AlGaAs Lateral Quantum Dots Chloé Bureau-Oxton1, Julien Camirand Lemyre1, Michel Pioro-Ladrière1 1Département de Physique, Faculté des Sciences, Université de Sherbrooke This paper presents a detailed fabrication protocol for gate-defined semiconductor lateral quantum dots on gallium arsenide heterostructures. These nanoscale devices are used to trap few electrons for use as quantum bits in quantum information processing or for other mesoscopic experiments such as coherent conductance measurements. Preparation of Rat Tail Tendons for Biomechanical and Mechanobiological Studies Amélie Bruneau1, Nadia Champagne1, Paule Cousineau-Pelletier1, Gabriel Parent1, Eve Langelier1 1Groupe PERSEUS, Faculté de Génie Département de génie mécanique, Université de Sherbrooke This article describes the experimental procedures used to prepare rat tail tendons for biomechanical and mechanobiological studies. 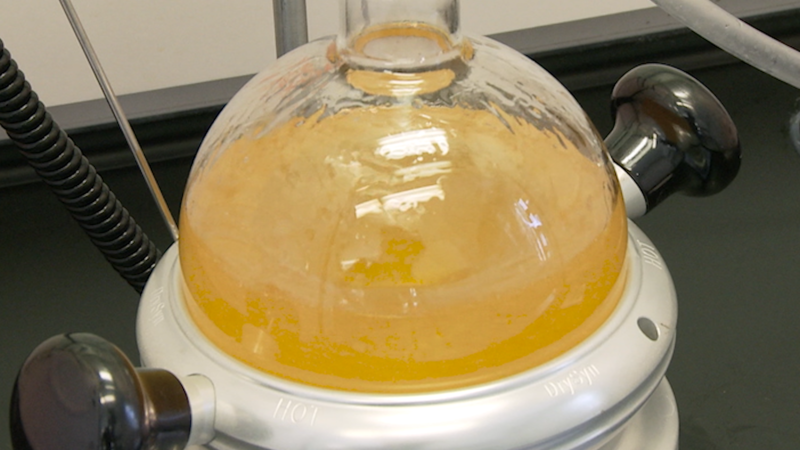 Several features of the main steps in preparation are demonstrated, beginning with extraction, cross-sectional area measurement, rinsing and loading into the bioreactor chamber.